So I promised I would show the kids room once everything was ready, and I'm finally making good on my promise. 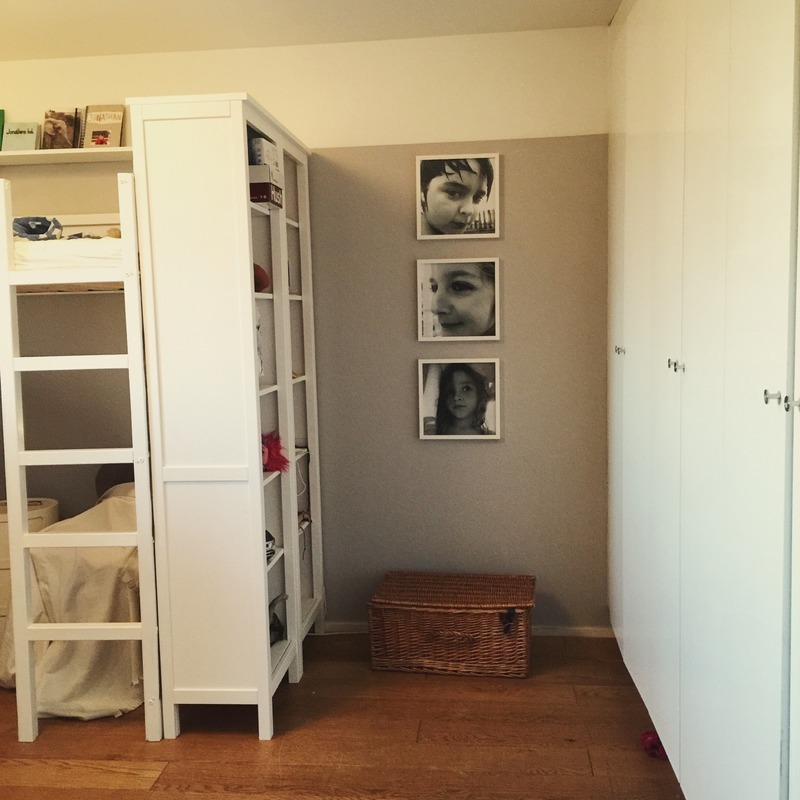 As I started discussing in this post, for various reasons we'll continue to live in my small two bedroom flat in the nice area well suited for kids, rather than move to something bigger and further away, or get the house I was envisioning before I fell ill.
And in deciding to stay, we needed to improve the room the boys share. They don't really mind sharing room, and I think in many ways it's good for them, but each needs his own space too, for his own things, his private hideaway. That's why we planned and planned and came up with a new way of making the most of their room. 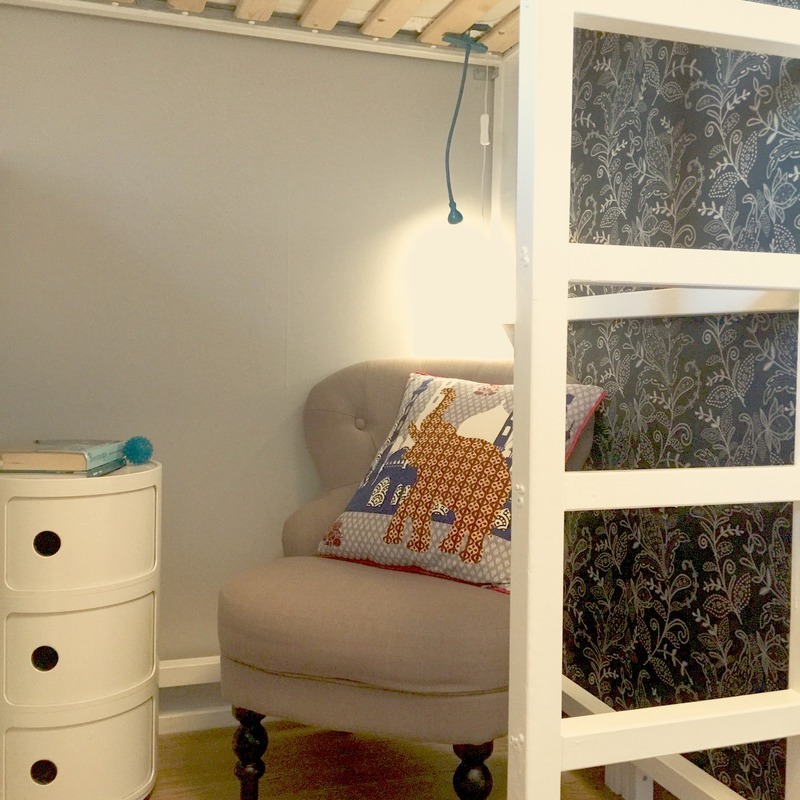 The three story bunkbed of my dreams didn't pan out as the ceiling height is a mere 2,4 metres, but I came up with this alternative, which also provides a reading nook for when we put them to bed, or for when they want somewhere cosy to sit and read during the day. I say read, but they mainly use it for playing on their iphones. One of the walls in the reading nook consists of the back of two bookshelves, to make it prettier I’ve covered it with a fabric. The chair comes from Åhlens and the little table, that doubles as Milo’s storage space, comes from Kartell. Originally it functioned as my bedside table, but this way it fills a better function. 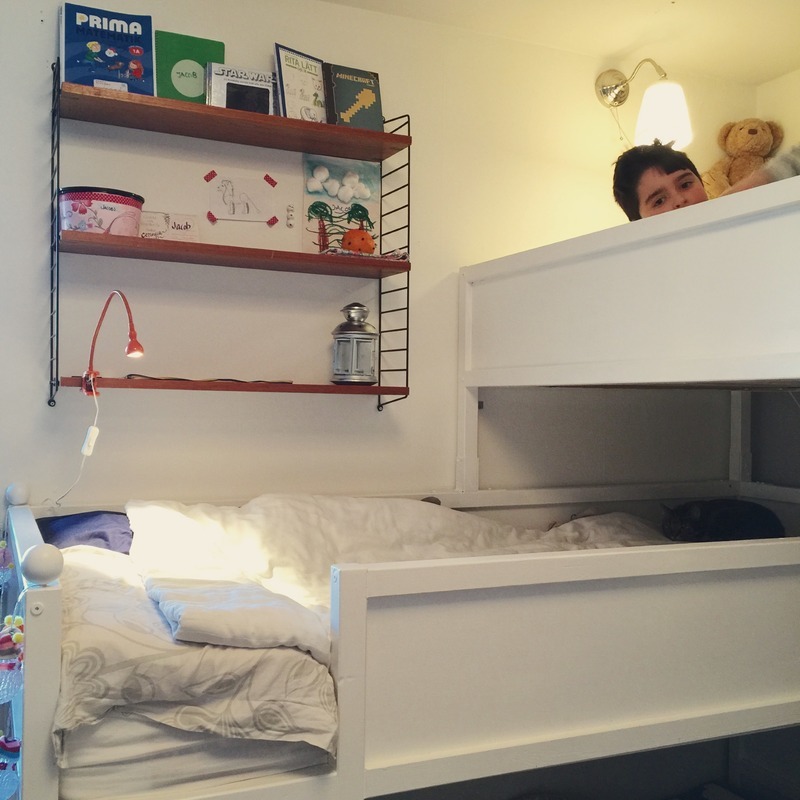 All the boys have some sort of personal storage by their bed - Jacob got one of my old String shelves, and Jonathan got a shelf the length of his bed, though quite narrow so that he doesn’t bang his head on it at night. For now, the Kartell table will be Milos storage. 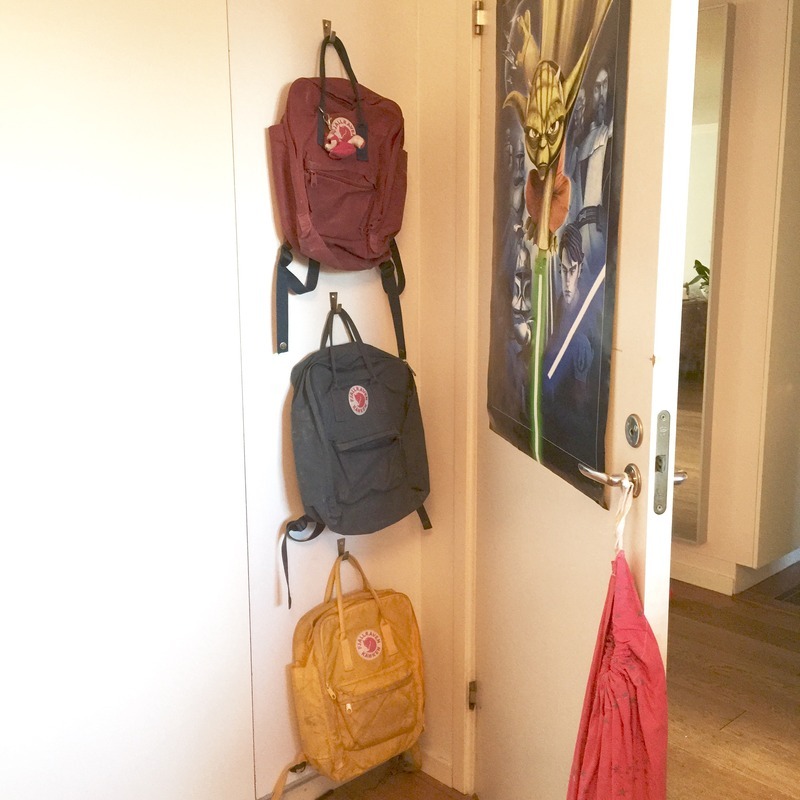 We really did end up using absolutely every bit of space in the room - behind the door the kids have hangers for their backpacks. They just about fit in the small space between the wall and the door. That's also the only place I would allow them to put this hiddeous Star Wars poster - this way, the only was it's seen is when they close the door. 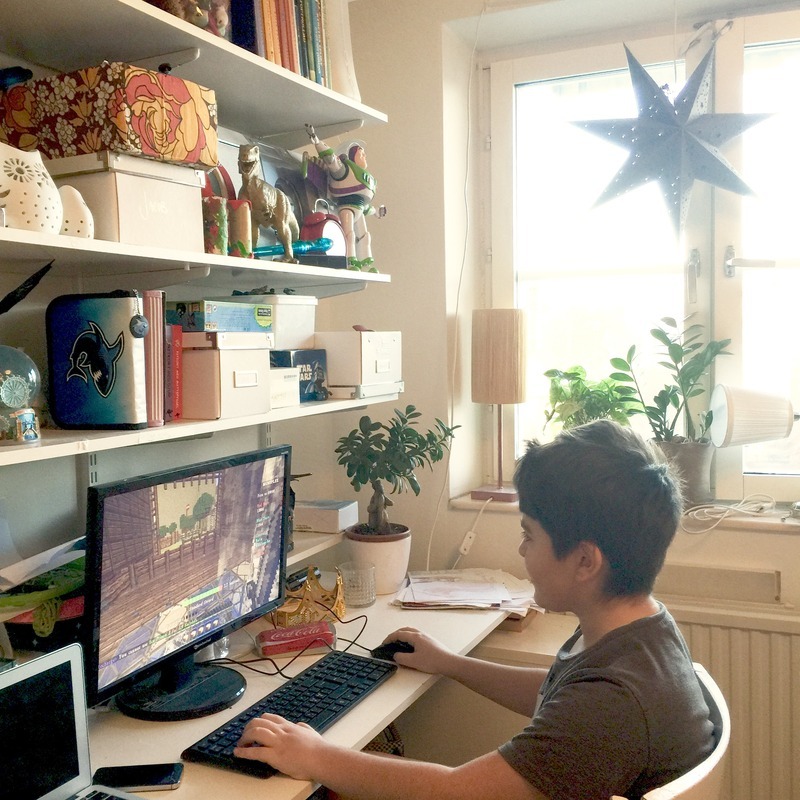 On the other side of the room is two metres of shelf storage and a table for their computer and space to do homework. I honestly still cannot understand how we managed to fit all these functions in one 12m2 room. For this renovation, we really tried hard to be environmentally friendly and use what we had, buying only a minimum amount of new things, and then not buying plastic or easily breakable things. The only new things we got was Jonathans lamp, one of the bookshelf (we had one before), the armchair for reading, some supplies, wood and and the gray paint on the wall. It ended up costing us very little, apart from the time and effort it took to make, and the end result is such a drastic improvement on what they had before, I can’t help but be well pleased.